Creation of the entity-relationship model is one of the most important stages in the process of creating databases and modeling of business processes. 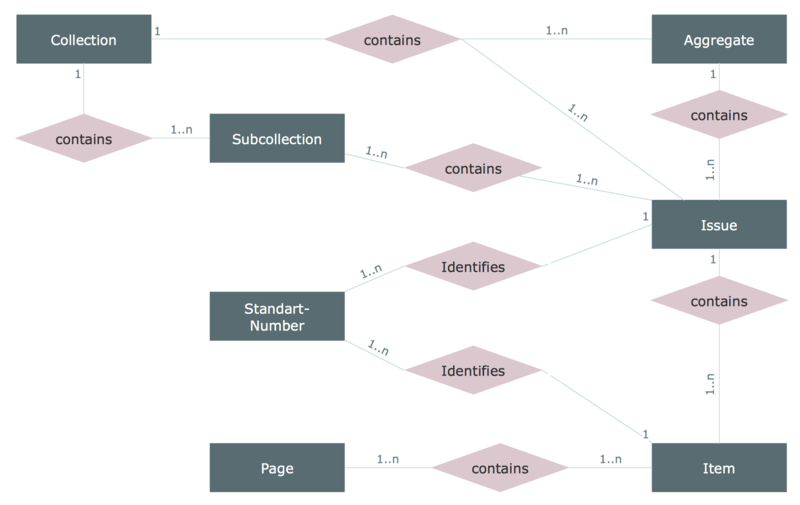 Entity Relationship Diagram (ERD) reflects reality and allows you to get the most complete picture about the actual data requirements that are set at the company. The entity-relationship model described in form of ERD represents the information that is gathered and used at the conduct of business. 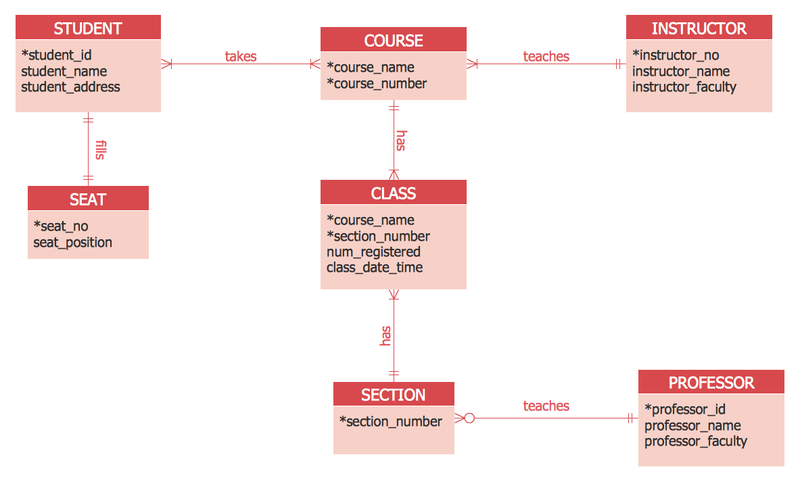 It visually shows how the database or application system will look, but doesn't disclose a way of realization. The ERD doesn't depend on the choice of database producer. It groups the data into separate entities and links these entities to each other on the base of business rules. The entity has the contents and represents some object about which is needed to store information. The business rules is a line of conduct and procedures for the business organization, they describe how the company is functioning. The ER diagram is constructed from the specific ERD graphic elements. There are used 2 types of ERD notations: Chen and Crow's Foot. A complete set of work flow shapes, notation & symbols for ERD, entity relationship stencils, included in Entity-Relationship Diagram (ERD) solution for ConceptDraw DIAGRAM software, makes drawing diagrams based on ERD notation as smooth as possible. All these ERD symbols are vector, you can drag to the document to construct the ER Diagram, resize any of them without loss of quality, change their color to make your diagram more attractive and colorful. Entity An entity is represented by a rectangle which contains the entity’s name. Weak Entity An entity that cannot be uniquely identified by its attributes alone. The existence of a weak entity is dependent upon another entity called the owner entity. The weak entity’s identifier is a combination of the identifier of the owner entity and the partial key of the weak entity. Key attribute An attribute that uniquely identifies a particular entity. The name of a key attribute is underscored. Multivalued attribute An attribute that can have many values (there are many distinct values entered for it in the same column of the table). Multivalued attribute is depicted by a dual oval. Derived attribute An attribute whose value is calculated (derived) from other attributes. The derived attribute may or may not be physically stored in the database. In the Chen notation, this attribute is represented by dashed oval. Weak (identifying) relationship A relationship where Child entity is existence-dependent on parent, and PK of Child Entity contains PK component of Parent Entity. This relationship is represented by a double rhombus. The samples you see on this page were created in ConceptDraw DIAGRAM using the Entity-Relationship Diagram (ERD) solution from Software Development area of ConceptDraw Solution Park. An experienced user spent 10 minutes creating these samples. Use the Entity-Relationship Diagram (ERD) Solution for ConceptDraw DIAGRAM software to create quick and easy your own professional looking ERDs using Crow's Foot and Chen notations. ERD drawing becomes easier with predesigned entity relationship symbols, work flow shapes, entity relationship stencils. 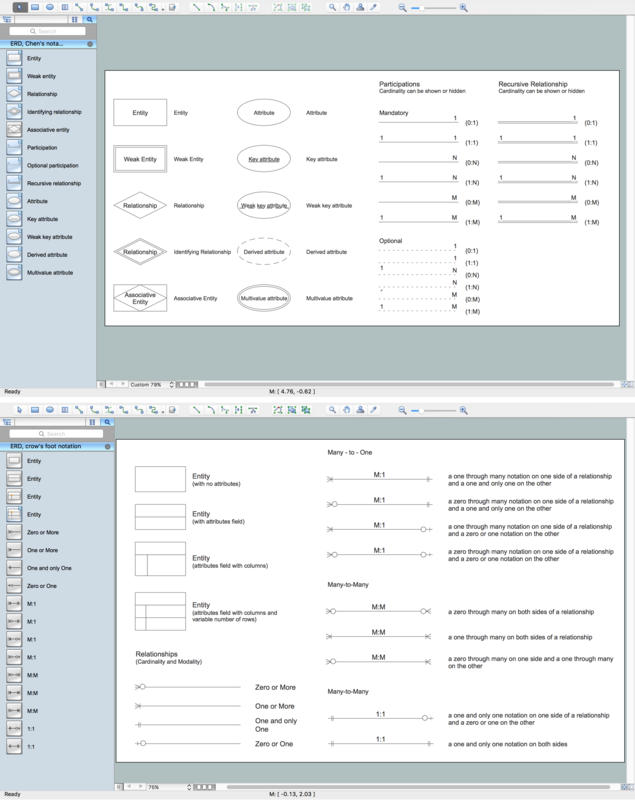 All variety of ERD symbols you may need for ERDs design is packed into libraries and templates from Entity-Relationship Diagram (ERD) Solution for ConceptDraw DIAGRAM v12 diagramming and vector drawing software. But anyone have an ERD symbols quick reference? Detailed reference information for them is represented at the tables. Picture: Anyone Have an ERD Symbols Quick Reference?